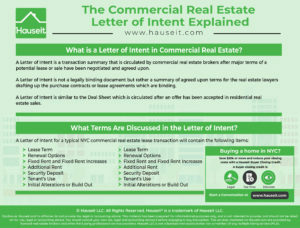 What is a Letter of Intent in commercial real estate sales and leasing? Is a Letter of Intent binding? What terms and conditions are discussed? 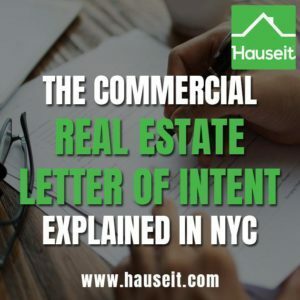 We’ll explain everything you need to know about Letters of Intent and how they work in NYC commercial real estate. 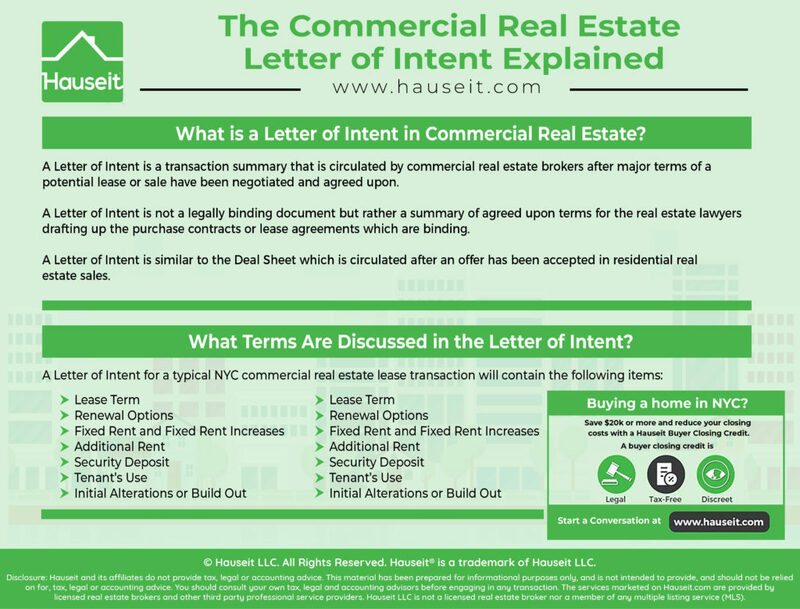 What is a Letter of Intent in Commercial Real Estate? What Terms Are Discussed in the Letter of Intent? A Letter of Intent is a transaction summary that is circulated by commercial real estate brokers after major terms of a potential lease or sale have been negotiated and agreed upon. A Letter of Intent is not a legally binding document but rather a summary of agreed upon terms for the real estate lawyers drafting up the purchase contracts or lease agreements which are binding. A Letter of Intent is similar to the Deal Sheet which is circulated after an offer has been accepted in residential real estate sales. Pro Tip: Commercial real estate brokers should strive to make the Letter of Intent as complete and detailed as possible to save time from having the lawyers clarify and negotiate additional points. The more complete the Letter of Intent, the faster the transaction can close. Pro Tip: Most of the transactions you’ll see in the commercial real estate space will involve leasing vs sales. That’s because leasing makes the most sense for most businesses due to the flexibility to expand or sublet. Furthermore, commercial real estate inventory for sale is rather limited in NYC. In fact, the commercial units of new construction condominiums being built today are typically retained by the sponsor. In New York City, the landlords typically hold all of the leverage even in periods with softer market dynamics. As a result, it is the landlord’s attorney who will prepare the initial draft of the lease agreement. The landlord’s attorney may use any number of standard forms (i.e. REBNY, Blumberg, NY Bar Association etc. ); however, they will always attach a lease rider that will typically be much longer in length. For example, a standard form may be 7 to 10 pages long, but the lease rider may be 40 to 45 pages in length and completely override what is said in the standard form. Some landlords have developed their own customized lease forms over time, in which case a separate rider may not be necessary. Unlike in residential sales, it will be very rare for a commercial tenant to have a rider of their own. In fact, landlords will reject most tenant requests to change or edit a commercial lease. The traditional reason for this is because courts in New York tend to favor tenants, so landlords hedge this risk by having tough leases with language that strongly favor the landlords. With that said, bigger and more important tenants such as universities, anchor tenants and national chains will have more negotiating power. Note: Despite the rise of office sharing start-ups like WeWork and reduced demand for commercial real estate in general due to e-commerce, we haven’t seen landlords become more flexible in NYC. In fact, the rising number of vacant storefronts in NYC simply means that the landlords can afford to wait and are in fact waiting for the next brand name tenant. Keep in mind that in the 1980’s you had an average of 450 square feet per person. Today, you have only 135 to 150 square feet per person despite the competition from the internet. You should engage a real estate attorney who specializes in commercial real estate transactions as soon as possible. Your attorney will advise you on language you should add as a precaution to any Letter of Intent to make it especially clear that it is indeed non-binding. This is especially important if you will be signing the Letter of Intent. This is different vs residential real estate sales where the Deal Sheet is never signed. It’s a good idea to be extra cautious given that there have been court cases where Letters of Intent have been ruled by courts to be binding. This has happened when either party has issued a press release or otherwise celebrated their “deal” after signing a Letter of Intent. Courts have ruled that these actions meant that the Letter of Intent they signed was in fact a binding agreement. This Letter of Intent is not a legally binding document for either party and is only a summary of the basic terms and conditions to be incorporated into a formal written agreement. This Letter of Intent does not obligate either party to negotiate in good faith or to follow through and complete a formal written agreement. Pro Tip: Be very careful working with a generalist attorney without specific commercial real estate transaction experience. Landlords’ attorneys will all specialize in commercial real estate and are known to decimate generalist attorneys representing tenants. For example, one well known landlord’s attorney likes to put generalist tenants’ attorneys at ease by saying they’ll use the standard REBNY form. The tenant’s attorney is typically relieved and thinks to him or herself, how hard can that be? Little do they know that the real meat will be in the lease rider that is to come. More Questions? Have any question answered in Hauseit’s Forum, where New York real estate professionals come together to discuss the toughest questions in real estate.